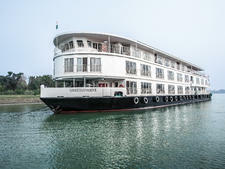 S.S. Catherine, the latest new-build to join Uniworld's fleet, is absolutely unique, which is exactly what the company intends. 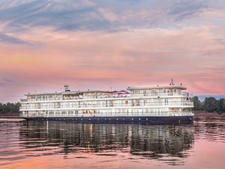 Unlike river cruise companies that emphasize identical vessels, Uniworld takes the opposite approach to decor and design, ensuring that all ships have individual personalities. 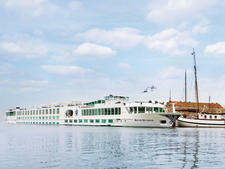 For S.S. Catherine, which was christened by Catherine Deneuve, the image is elegant, comfortable, colorful and whimsical. 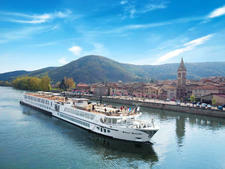 From its home port in Lyon, the 159-passenger ship travels to Burgundy and through Provence on France's Rhone River. The second new-build for Uniworld (though the line is constantly refurbishing ships), S.S. Catherine has some similarities in layout and decor to S.S. Antoinette, which debuted in 2012. 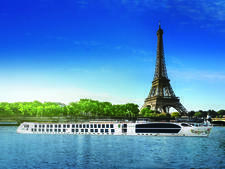 In both cases, a unique-to-Uniworld cabin design means that some staterooms have private balconies and French verandahs (one nifty new touch on S.S. Catherine is the addition of a screen to keep flies away). 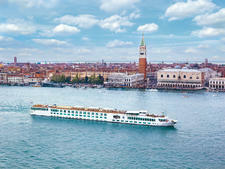 The ships' art collections are stellar, and they each have a real swimming pool, which is fairly unusual on the rivers. Uniworld is part of the family-owned Travel Corporation, which operates 24 different travel companies, ranging from Trafalgar to Contiki Holidays to Red Carnation Hotels. The Tollman family is very hands on in terms of creating the unique ambiences onboard its ships; S.S. Catherine's designers were Mrs. Beatrice Tollman, the family matriarch, her daughter Toni Tollman, and Brian Brennan. The ambience reminds us of a super-luxurious country house hotel. No costs were spared in outfitting it with silk wall coverings, lavish furnishings, and a compelling and beautifully curated art collection (don't miss the contrasting green Murano chandelier or the fabulous waterfall that encircles the glass elevator). Also unforgettable on S.S. Catherine is the Bar du Leopard. Taking multi-functional to a new level, the lounge serves as the ship's secondary eatery, dance venue and chill-out space. It is clubby and yet also funky, thanks to the leopard-print fabrics, elephant-head bar rails and other safari-themed fixtures. Perhaps the most distinctive feature of the Bar du Leopard is its glassed-in swimming pool. Because low-slung bridges on the Rhone River limit sun deck features, S.S. Catherine's pool has been spared nothing, and the result is a gorgeous space. In keeping with the lounge's jungle theme, it has a lush, garden-esque mosaic tile mural. 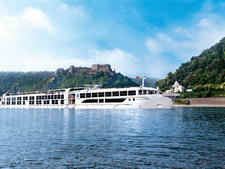 Uniworld also considers creature comforts as important as design. Cabins, in particular, are reminiscent of top-notch hotels, with custom-made Savoir of London beds, fabric-covered walls, and marble bathrooms with heated floors and towel racks, and really roomy showers. 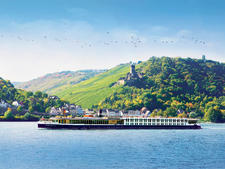 The 80 cabins, in eight categories, are situated on three decks. 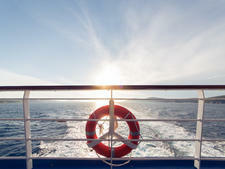 The majority of staterooms measure between 162 and 194 square feet. There are five suites forward on the upper Camargue Deck that measure 305 square feet. The Royal Suite, on the same deck, measures 410 square feet. The largest suite has a separate living room and a bathroom with a rain shower and bathtub. All the suites and Category One cabins, also on the upper deck, have balconies. The two Category Two staterooms here have French balconies. Cabins on the middle Avignon Deck feature French balconies. The 13 cabins on the lower Saint Remy Deck, which include one single cabin, have fixed windows. Standard cabin amenities include a marble bathroom with L'Occitane products, towel warmer, bathrobe and slippers, hair dryer, safe, flat-screen TV and complimentary bottled water. Additional amenities in each suite include butler service, room service breakfast, daily fruit and cookie plates and evening canapes, DVD player, iPod dock, tea- and coffeemaker, refrigerator, bottle of wine on arrival and free laundry service. 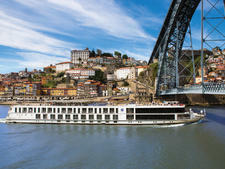 The Cezanne Restaurant is forward on the Avignon Deck and is the main dining venue for breakfast, lunch and dinner. There are two options: A lavish buffet with stations for hot food and cold salads (or, at breakfast, eggs prepared to order and yogurts, fruits and pastries) and also a menu for a la carte fare. At dinner, the restaurant is menu service only. 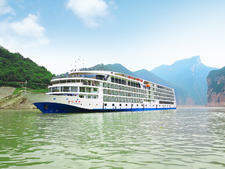 The cuisine onboard is continental, with a contemporary flair. Other public areas include the lavish and sprawling Van Gogh Lounge, which is the primary gathering space onboard; there's a bar and tables both inside and outdoors. Enrichment and other entertainment activities take place in the lounge. There's also the Matisse Terrace, the ship's top deck sun lounge that has chess and shuffleboard in addition to comfortably padded chaise loungers. S.S. Catherine has a gift shop that incorporates a 24-hour coffee station and cafe tables, serving as an additional place to gather. There's free Wi-Fi and a well-stocked laundry room with complimentary washers and dryers. 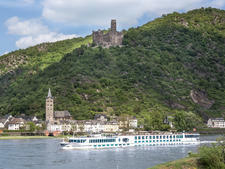 Two other aspects of our S.S. Catherine cruise stood out for us. 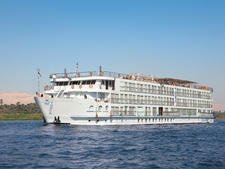 Crew – from butlers who serve the suites to waitstaff – are superbly trained, efficient and cheerful. It's the kind of ship where, after the first day, you're commonly greeted by name. 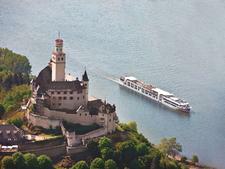 The shore excursion offerings are also superb and varied. 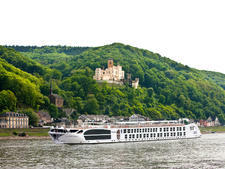 On a typical seven-night Burgundy/Provence cruise, tour options will either allow you to see a port's marquee attraction – or, for those who are veteran travelers – visit something more offbeat. 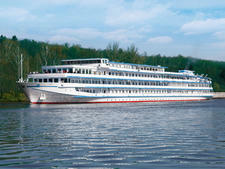 Uniworld's Go Active program emphasizes use of the ship's bicycles and Nordic walking sticks (which are also available to all passengers, free of charge, when not in use for tours) as well as hiking and kayaking (for passengers who prefer to move more slowly, there's also complimentary Gentle Walking Tours). 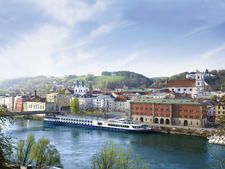 Uniworld's Do As The Locals Do tours, typically offered at an extra charge, include activities such as a guided visit of Lyon's world-famous food market.